Objective: At the last second, the Dragon Egg was stolen by a large vicious bird called a Vultragon who makes its home in the Sneevil Dump Site. You must track down the egg thief and get your egg back! Objective completed: You found that the Ultra Vultragon's nest was filled with large eggs that ALL looked like your Dragon Egg, so you took all six...uh...five of the eggs. 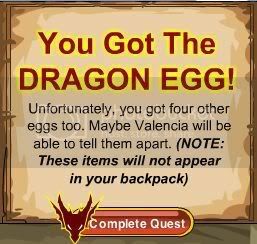 Valencia: A huge Vultragon stole the egg? I bet it was "Ultra-Vultragon!. He lives at the top of.... Mt. Moordoor! Valencia: Moordoor? It is a deadly mountain of treasure and the bane of door to door salesmen everywhere! A huge Vultragon lives at the top. Valencia: Vultragons? They are wretched scavengers that steal and eat each other's eggs. Their eggs look very similar to Dragon Eggs. <Character>: Ah HA! There they are! All... six... of them? <Character>: OK, so there are SIX eggs. SO what? I'll take six and sort them out later. <Character>: I don't want to hear it. You stole MY egg in the first place. The rest of them are probably stolen too. 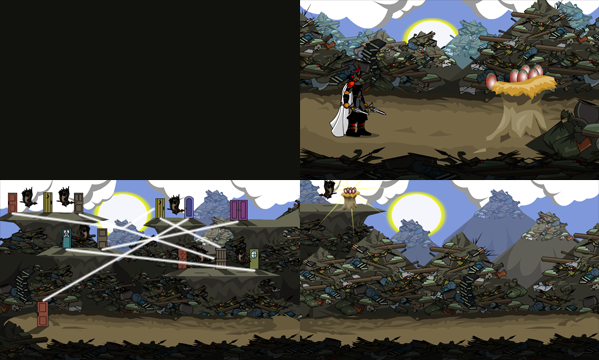 <Character>: Besides, Do you think I'm just going to stand around and talk after that LAST cutscene? <Character>: No way, birdbrain! I'm taking all those eggs and I'm getting out of here as fast as I can. <Character>: I WANT MY EGG! <Character>: AT LAST! I'm not sure which of them is my egg, but I'm going to find out. Until then I'll have to keep them all safe. <Character>: ...all FIVE of the eggs! -- Cool Dragonz for a typo correction. -- Kilza for the Up Next link.